After breathing, the journeyer (still somewhat altered and assisted by the co-journeyer) engages in one or more expressive art forms (mandalas, sculpting, mask-making, collages, Shamanic Shakti Painting Process, etc.) as well as sacred scribing. In sacred scribing, the journeyer describes in detail what their specific experience(s) were during their session. The co-journeyer scribes what the journeyer tells them in a journal and relates back and scribes what their own experiences were during the journeyer's Shamanic Breathwork. This process allows for integration and grounding as well as for the journeyer and co-journeyer to briefly process together what their experiences were during the session. The Shamanic Shakti Painting Process (SSPP) is about the Sacred Marriage of the Shamanic and the Shakti energies. It is a calling in of the Shaman within, that Divine Witness and Healer, to show up as witness and to hold the space for the language and vision of the soul revealed through the painting process. The Shaman within is summoned with the ritual of smudging and the setting of the intention for healing and revealing. The Shakti energy is activated and invited in through the process of kidney breathing. The kidneys flow and filter that deep wellspring of creative energy. The SSPP then requires the participant to enter into the commitment of communication between soul and ego through the application of paint to paper, allowing the colors to be chosen and the movement of the brush to be informed by the inner voice, the feeling and movement from deep within the body of the painter. The SSPP is not about thinking about what will be painted. It is not about putting onto paper any representation of the outside world. It is about using paint, paper, energy, commitment to the process, and the act of surrender to reveal to the painter what the soul and the Shaman within need the painter to see and to feel for deeper understanding and healing. The use of the mandala drawing can be an extraordinarily powerful tool in the Shamanic Breathwork process. The mandala is a form of expression in which the journeyer artistically describes their experience in pictorial form. The Sanskrit word mandala means "circle." Indeed, each mandala begins with a softly drawn circle on a large piece of art paper or other media. The mandala circle is a suggestion--a starting point from which the journeyer's experience comes to artistic life. Almost invariably, the experience pours from the journeyer's psyche onto the paper, overflowing the confines of the suggested circle and consuming the entire media. This artistic expression allows the journeyer to quietly reflect upon their experience, using the mandala as a form of expression to encapsulate that which words alone cannot. The mandala is both a reflection of where we are now as well as a preview of coming attractions in our lives. The goal of contemplating the processes depicted in the mandala is that the yogi shall become inwardly aware of the deity. Through contemplation, he recognizes himself as God again and thus returns from the illusion of individual existence into the universal totality of the divine state. I had to abandon the idea of the superordinate position of the ego. I saw that everything, all paths I had been following, all steps I had taken, were leading back to a single point--namely, to the midpoint. It became increasingly plain to me that the mandala is the centre. It is the exponent of all paths. It is the path to the center, to individuation. I knew that in finding the mandala as an expression of the self I had attained what was for me the ultimate. Contained with each individual mandala is often essential information for the journeyer about the meanings of the images, symbols, and motifs they experienced during their Shamanic Breathwork journey. These images, symbols, and motifs are interpreted both literally and for their underlying metaphorical meaning. One of the powerful aspects of mandala interpretation is examining the archetypal themes inherent in them. Present in all people in all cultures, archetypes have been recorded by dreamers across time and from all walks of life with remarkable commonalities. Engaging in a spirited dialog with the archetypal forces visible in our mandalas allows each of us to integrate material that may otherwise exist outside of our waking consciousness. In this process of recognition and integration, we have the opportunity to fully engage with and purposefully invite core archetypes into our consciousness so that we may live and learn their lessons rather than resist them unconsciously. 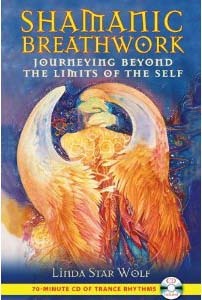 To order Shamanic Breathwork from Amazon.com, click here!